Spicy, meaty with a wonderful deeply flavoured broth. I love Almodovar's movies. Spain has certainly been blessed by having him as a citizen. And I understand exactly what he means. Here (in a far less cultural way) we’ve been blessed with warm weather for several days lately, but don’t be fooled. It is the calm before the storm – probably literally. The pork belly. Sounds a bit gross, but it's certainly not. It's also relatively inexpensive. You should look into it. Sooner or later we’ll be back to what passes for normal November temperatures. That means low single digits during the day (in Celsius here in Nova Scotia). Brrr….. So to counter this – and to just make us feel better – we should turn to heartier, richer foods in the kitchen. You all have your favourites I’m sure. Pot roast, beef stew, you name it. Have you ever though of turning to cuisines that may be a little out of step with our North American tastes? It doesn’t have to be too exotic either. One such cuisine I like to go to is Spanish. Much of Spanish food has roots in rural life, using local ingredients that are in season at specific times of year. Spain is divided into many distinct regions including Basque, Catalonia, Madrid, Andalusia… I don’t wish to offend anyone by not listing them all but there are well over a dozen – more than would be easy to read in a list. Each cuisine has their own differences, but there are some commonalities. Most ingredients in Spanish food are well known in North American kitchens. Spanish food usually has either olive oil or lard, and garlic – lots of garlic. This is the stew just before it simmers. The Spanish are also quite passionate about their sausages. One of the favourites is Chorizo. Chorizo is a pork sausage flavoured with paprika, hot chilli and garlic. They can be fresh, smoked or dried. Paprika is a very common ingredient in all its iterations. There are a few basic types of paprika (which is ground red bell or chilli pepper). It can be hot—or not—and is also sometimes smoked for added flavour. It’s in the depth of all the individual ingredients where Spanish cuisine really sings, and is what makes it so satisfying. This recipe has a lot of the ingredients that make Spanish food so special. Garlic, sweet tomatoes, tender pork, spicy sausage – it’s all in here. 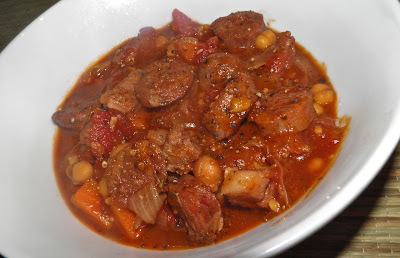 It is then simmered to a delicious and rich stew that makes the cooler weather a little more bearable. Just so you know, fresh and cured chorizo are available at Pete’s Frootique here in Halifax and Bedford. Made in the store they’re quite affordable. You can also find them occasionally at the major grocery chains. If you’re looking for a new favourite stew, give this recipe a test drive. Depending on your tolerance for spiciness you may want to adjust the amount of chilli flakes. It has a lot to do with the spiciness in your chosen sausage. I say go for it. What’s dinner without breaking out in a sweat! for 1-2 hours the tomatoes will just about melt away. Preheat the olive oil in a Dutch oven or other large pot. Chop the pork belly into 1/2” pieces. Add to the oil and cook until some of the fat renders out and the meat is slightly browned, about 3 minutes. Remove to a plate. Add the whole sausages and cook until browned, about 2 minutes per side. They do not have to be cooked through, but should be firm. Remove to a plate, let cool slightly and then slice. Chop the onion, garlic and carrot. 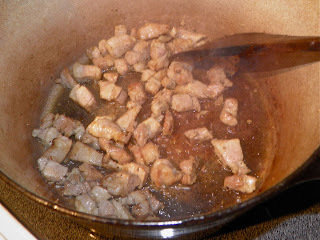 Add to the oil/pork fat and sauté until the onions soften slightly, about 3 minutes. Return the pork belly and sausage to the pot. 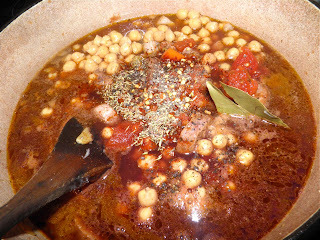 Add the drained chickpeas, diced tomatoes, stock and remaining ingredients. Stir well. Bring to a boil. Then reduce the heat to medium and let cook, uncovered, for about 45 minutes. 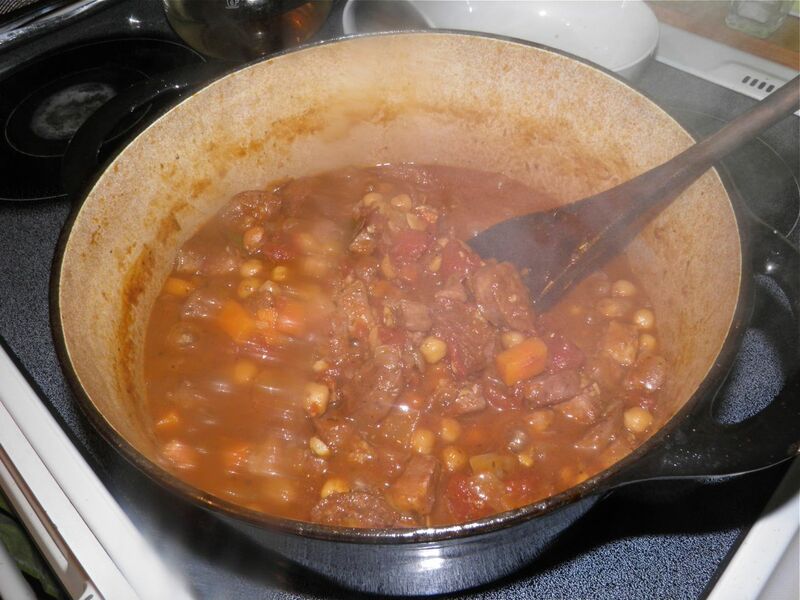 * Stir every so often to ensure the stew doesn’t stick to the bottom. The liquid will reduce and make a thick, rich sauce as it cooks. If necessary, add a little more water as it cooks. Serve with crusty, warm bread with butter. * Alternatively, if you have the time you can cover the pot, reduce the heat to simmer and cook for 1.5 to 2 hours. Stir occasionally and check liquid level as above.